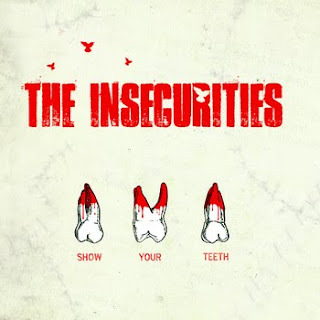 After debuting last year with Ban the Kiss Hello (reviewed here), Chicago's The Insecurities have returned with a seven track album called Show Your Teeth. The band's debut EP notably marked a distinct change in direction for front man Stubhy Pandav - best known as vocalist for pop punk act Lucky Boys Confusion - with mellower, more thoughtful material rooted in a mix of Americana, power pop and straight-ahead alt-rock. The end product was a cohesive collection of songs that could appeal to a more diverse crowd and was solid enough to position the band as one to watch. On the aptly-titled follow-up Show Your Teeth, The Insecurities take an overall harder-edged approach, arming tracks such as "Dive Bar Queen" and "Bonnie Vs. Clyde (Mister Mister)" with a gritty punk snarl that was absent on their first release. Following suit are Pandav's lyrics, which are more biting and cynical than before, often dripping with contempt and cynicism. The band's penchant for genre-hopping eclecticism is in tact, though, as evidenced by the brassy, jazzy groove incorporated into "Bonnie Vs. Clyde" and harmonica touches on "Stop-Loss." Other highlights include disc openers "Run Run Baby" and "Bleeding Heart," two upbeat pop-rock anthems with hooks grab hold instantly. With another batch of strong material, Show Your Teeth finds The Insecurities avoiding a simple retread of their debut - opting for a bigger, bolder approach - without discarding the elements that made Ban the Kiss Hello a success. Pick up a copy of the record on CD Baby or iTunes and check out the band live October 28 at Rizzo's in Naperville and November 20 at the Cornerstone Ballroom in Darien (click here for additional dates).